[161 Pages Report] The overall fuel tank market is expected to grow from USD 13.2 billion in 2017 to USD 17.38 billion by 2021, at a CAGR of 5.58% from 2016 to 2021. Market growth is primarily driven by the increasing vehicle production across the globe and the rising demand for lightweight automotive solutions. Additionally, developed regions such as Europe and North America have introduced stringent evaporative emission norms, which have accelerated the demand for plastic fuel tanks in these regions. The base year considered for the study is 2015, and the forecast has been provided for the period between 2016 and 2021. High-density polyethylene (HDPE) is the key component of the plastic fuel tank. The global demand for HDPE is very high, owing to the considerable demand for plastic fuel tanks. The primary advantages of the plastic fuel tank are that it is anti-corrosive, lightweight, flexible, and impact-resistant. HDPE market is estimated to be the largest owing to their high penetration in developed regions such as North America and Europe. The changing preferences of buyers and the increasing technology adoption rate in Asia-Oceania have accelerated the demand for HDPE fuel tanks in the region. The research methodology used in the report involves various secondary sources, including paid databases and directories. Experts from related industries and suppliers have been interviewed to understand the trends prevailing in the automotive fuel tank market. Country-level model mapping has been conducted for vehicles manufactured in the particular country. The bottom-up approach has been used to estimate the market size, in terms of volume. This country-wise market volume is then multiplied with the country-wise average OE price of fuel tanks of each material type in every country considered in the region. This results in the country-wise market size, in terms of value. 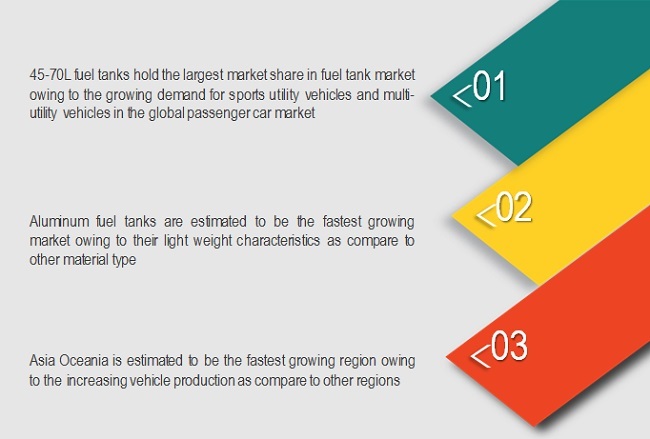 The summation of the country-wise market size, in terms of value, gives the regional market size, and further summation of the regional-level market size provides the global automotive fuel tank market size. The figure below illustrates the break-up of the profile of industry experts who participated in primary discussions. 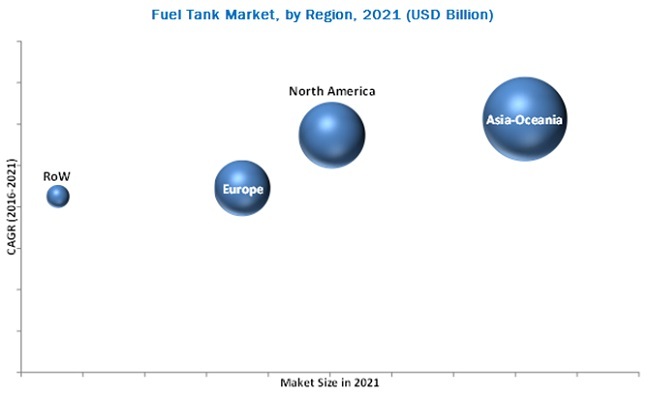 The global fuel tank market ecosystem consists of raw material manufacturers such as ArcelorMittal (Luxembourg), Hebei Iron and Steel Group (China), Baosteel Group Corporation (China), Posco Co. Ltd. (South Korea), and Tata Steel Ltd. (India). It also includes automotive fuel tank manufacturers such as The Plastic Omnium Group (France), Kautex Textron GmbH & Co. KG (Germany), YAPP Automotive Parts Co. Ltd. (China), and TI Automotive Inc. (U.K.), vehicle manufacturers such as General Motors (U.S.), BMW (Germany), Toyota Motors (Japan), and Hyundai Motors (South Korea). In May 2016, Magna announced expansion of its aluminum casting facility in Telford, U.K., to supply automotive parts to Jaguar Land Rover models. The construction is expected to start in the autumn of 2016. This facility will produce a number of lightweight aluminum castings by using Magna's high-pressure vacuum die casting process. In September 2015. The Plastic Omnium launched a new range of fuel tanks under the name TANKTRONIC. These fuel tanks are a fully mechatronic solution that optimizes fuel system performances for plug-in hybrid vehicles with pressurized fuel. This system enhances the diagnostic capability and helps to reduce the energy consumption. It also helps to optimize control of the fuel pump and the use of electronic pressure and level sensing. In October 2015, Magna entered into an agreement to acquire Stadco Automotive Ltd. (U.K.). Stadco Automotive Ltd. is an international tier 1 supplier of automotive Body-in-White products and services. Its core capabilities include aluminum and steel stampings, assemblies and facility design. This acquisition will improve the global foothold of the company and also help to strengthen the customer base. Which material type is going to dominate in the future? How are the industry players addressing the challenge of recycling of plastic fuel tank? What could be market size of SCR and CNG tank market in the future? The global automotive fuel tank market is expected to grow from USD 13.25 billion in 2018 to USD 17.38 billion by 2021 at a CAGR of 5.58%. The rising global vehicle production, growing trend of vehicle weight reduction, and norms pertaining to evaporative emissions have fueled the demand for automotive fuel tanks across the globe. Fuel tank is a container or reservoir to carry the fuel used by the vehicle. Fuel is stored in the tank and is supplied to an engine through a fuel pump. Apart from fuel tank, there are also other tanks that are equipped in a vehicle depending on the requirement, namely, SCR and CNG tank. Selective catalytic reduction is an advanced emission control technology that injects a liquid reductant into the exhaust stream of the diesel engine. This liquid agent is generally called as diesel exhaust fluid (DEF). The DEF is carried in a tank called the SCR tank located under chassis or frame of a vehicle. CNG can be used in place of gasoline or diesel fuel in automobiles. The tank in which compressed natural gas is stored is known as CNG tank. The high-density polyethylene (HDPE) segment of the automotive fuel tank market is estimated to have the highest growth potential. It is projected to grow at a promising CAGR during the forecast period. This growth can be attributed to HDPE’s proven benefits of vehicle weight reduction and low cost. Upcoming fuel-efficiency standards, such the Corporate Average Fuel Economy (CAFE) standards, are propelling the demand for plastic fuel tanks, which are manufactured using HDPE. These fuel tanks offer various advantages, such as higher corrosion resistance, better fire resistance, and better crash test performance, than conventional steel and aluminum fuel tanks. These factors are estimated to drive the demand for HDPE fuel tanks in coming years. The 45 L–70 L segment of the automotive fuel tank market is estimated to account for the largest market share, in terms of value. This can be attributed to the high installation rate of fuel tanks in the 45 L–70 L range. Fuel tanks falling under this range find application in both, passenger cars and light commercial vehicles (LCVs). Asia-Oceania is estimated to be the largest market for 45 L–70 L fuel tanks, owing to the high demand for mid-segment passenger cars in the region. Asia-Oceania is also estimated to be the largest market for automotive fuel tanks during the forecast period. This can be credited to the presence of countries such as China, which is the largest vehicle producer in the world, and India, which is emerging as a key automobile production hub for OEMs. Furthermore, the region is the largest vehicle producer in the world; this trend is expected to continue during the forecast period. The proven benefits of SCR in controlling vehicular emissions have accelerated its market growth across the globe. The growth in the SCR market can be attributed to the increasing stringency of the emission regulations across the globe. SCR efficiently reduces the NOx emissions from diesel vehicles, and is one of the cost-effective technologies to control emissions from diesel vehicles. CNG has comparatively lower carbon content than gasoline & diesel and consequently burns cleaner. Governments are promoting the use of CNG across the globe as CNG-powered vehicles emit lower tailpipe emissions such as PM, NOx, and carbon monoxide (CO) than trucks and buses which use diesel as fuel. This helps in meeting the stringent emission norms, which are being implemented in developed countries to reduce the impact on the environment due to transportation. Owing to these factors the global CNG tank market is expected to have a healthy growth rate in lining with the increasing production of CNG vehicles all over the world. Increasing sales of battery electric vehicle is a major restraining factor for the fuel tank market as these vehicle does not require a fuel tank. Electric vehicle technologies are becoming affordable with time. Moreover, governments are also taking effective measures such as tax subsidies to promote the adoption of electric vehicles. These vehicles, using pure electric powertrains, completely eliminate the requirement for a fuel tank, and therefore this may lead to decline in the fuel tank market growth in the global automotive market. The advent of quick charging batteries, have further fueled the demand for these vehicles among the end-users. The impact of these vehicles on the fuel tank market may be negligible currently; but these vehicles are expected to create a huge impact on the fuel tank market in the future. The global market is dominated by established players such as The Plastic Omnium Group (France), Kautex Textron GmbH & Co. KG (Germany), YAPP Automotive Parts Co. Ltd. (China), and TI Automotive Inc. (U.K.). 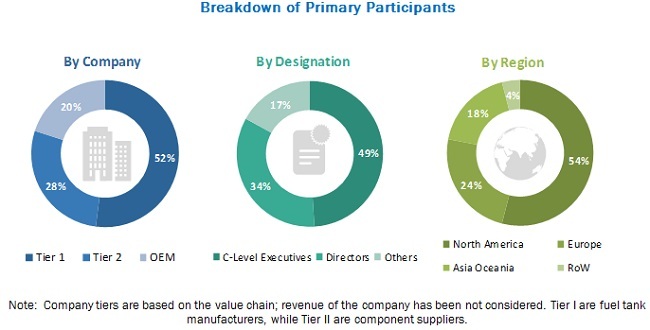 These companies have been focusing on developing new products and forming partnerships and collaborations with key organizations to expand their presence in the global automotive fuel tank market. 11.3 Yachiyo Industry Co. Ltd.
11.7 Kautex Textron Gmbh & Co. KG. 11.8 YAPP Automotive Parts Co., Ltd. Figure 54 SWOT Analysis: Yachiyo Industry Co. Ltd. Figure 57 SWOT Analysis: Magna International Inc. Figure 59 SWOT Analysis: Martinrea International Inc.